Caption slip reads: "Photographer: Hecht. Date: 1951-09-18. 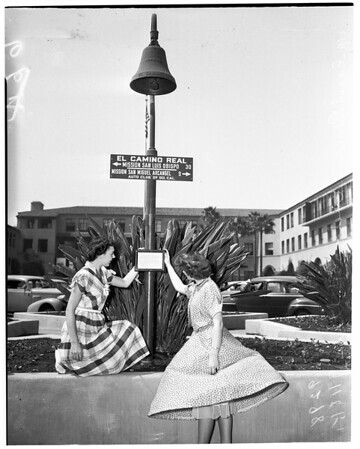 Assignment: El Camino Real sign and bell. 67/66, L - R: Carol Creer and Evelyn Holthus looking at El Camino Real sign in Auto Club court yard. 128/129: El Camino Real sign in the Auto Club court yard".